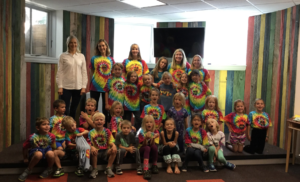 Welcome to IGNITE, The Alpine Chapel’s Children’s Ministry. We have the privilege of ministering to your children up to the 4th grade. Our vision is to enable them to always be ready to give a defense in a world where false views and philosophies are standing against the inerrancy of God’s infallible Word (1 Peter 3:15). Our goal is to provide a place where your children can learn, develop, and stand firmly in their own faith. Our hope is that they will not only believe that God’s Word is true, but also comprehend the great love He has for them. The Thompson children ate lunch at The Butcher and The Baker after church one Sunday and created this incredible artwork for all the patrons to see! God is moving in the hearts of our kids! Sundays, after the singing time, during our main service which starts at 10:00am. If it’s your first time with us, we will ask you for some information, including a cell # where you can be reached during the service. If, for any reason, you need to be contacted, we will simply text your cell*. On Sundays, teachers go through age-appropriate Bible lessons and activities geared toward enhancing your child’s understanding of and relationship with the Lord. These services are for children up to the 5th grade. On Tuesday afternoons, during the school year, we have an after-school program called Living Treasures. This special program is meant to provide children in grades K through 2 with a place to develop deep relationships with God under the guidance of spiritually mature adults and teenagers. Through this, children will have age-appropriate Bible lessons, small class sizes, older mentors, and service opportunities. The children are met at the school and walk to the church with their Living Treasure teachers. Ignite is our Sunday morning program for children up to 4th grade.